Martin’s HD-28 is iconic, powerful, and timeless. It brought to life the sounds that launched rock, country, bluegrass, and folk music. The newly updated version of the iconic HD-28 is the best it’s ever been with the addition of Martin’s most comfortable neck, vintage appointments, and scalloped, forward-shifted bracing. The HD-28 (2018) still features Martin’s classic herringbone trim and is crafted with East Indian rosewood, ebony and Sitka spruce tone woods for a powerful bottom end and rich tones that will fill any room. It’s music history made new. Want to win? 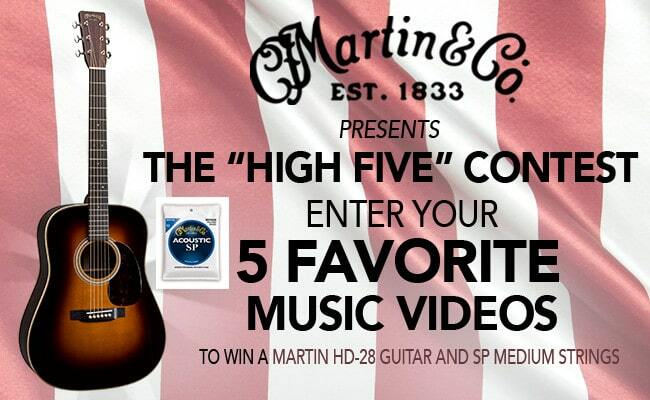 Simply fill out the form below and tell us your “5 Favorite Music Videos” and you’ll be entered to win a Martin HD-28 and a set of SP Medium strings. Selected entries will be printed in our May/June 2018 issue. Deadline: March 31st, 2018 at 11:59pm CST.